NOVA’s building envelope team is at it again! 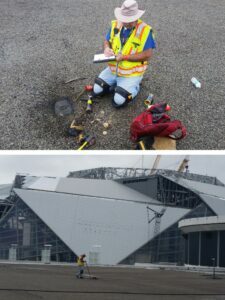 Doug Yarbrough, Kennesaw, and his team were busy spudding gravel from a built-up roof and performed a roof core test at the Georgia World Congress Center (GWCC) building earlier this week. Nice view of the Atlanta Falcons Stadium in the background!